The canary at the drill rig just croaked. Last week, one of the largest energy companies in the U.S. – and a major darling of the shale or “fracking” industry — started showing major signs of distress. “Chesapeake Plunges 40% on Report It Hired Restructuring Adviser” shouts the headline from Bloomberg. Chesapeake is closing in on bankruptcy? This is big news. And whether you’re an energy investor or not, there’s much to be gleaned from this huge story. Today, most of the major financial indexes are following the price of crude oil and the energy sector. As the drill bit goes, so does the market. And right now things are getting scary – which, as I’ll share in a moment, could be bad news for one “once safe” sector. With oil trading hands for less than $30 a barrel, there’s major strain on the American fracking industry. For most American oil companies, $50-60 dollars a barrel is needed just to break even. The same goes for gas companies like Chesapeake, natural gas prices are far below most frackers’ break even. Indeed, prices have moved so low that many U.S. oil companies can’t turn a profit and aren’t even drilling new wells. 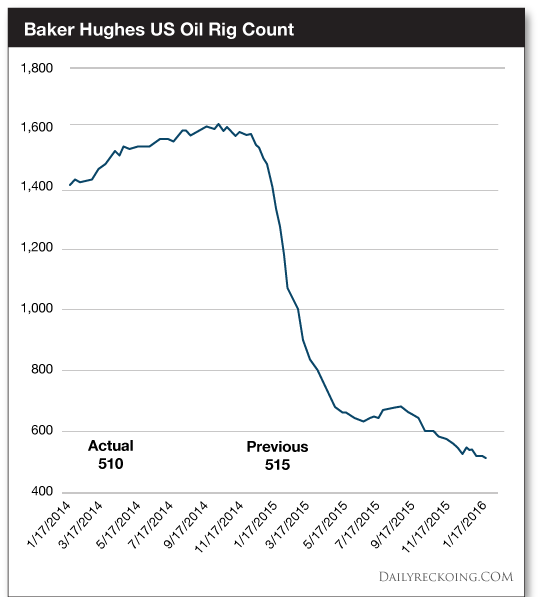 In the chart below you can see the number of active oil rigs has dropped tremendously. If we’re “following the rigs” there’s only one conclusion with the nearby chart. Companies like Chesapeake, the quintessential “go-go” shale players, look like they’re heading down a long road to restructuring and bankruptcy. That’s bad news for the drilling industry. But it’s also bad news for another once-safe energy sector. You see, when American frackers started producing enormous, unexpected amounts of crude oil and natural gas, the need for pipelines skyrocketed. More oil meant more money, for pipelines. But today the outlook for pipelines has taken a nasty turn for the worse. It seems simple, but if the producers start to go belly-up, then it’s only a matter of time before some of these newfound pipelines dry up as well. On cue, along with the Chesapeake news, three major pipeline companies dropped more than 30% on Monday. The major pipeline play that Chesapeake uses to transport their natural gas, Williams Companies, fell by 35%. Pipelines were once considered “safe” because their business model did not depend on the price of oil or natural gas. As long as there is ample supply in the pipe these companies collect “tolls” as the oil and gas passes through. However, these companies are now looking at the same problem plaguing the rest of the American fracking industry. Today, with fewer rigs and fewer wells being drilled, U.S. pipeline stocks will soon face a stiff headwind. But here’s where it gets much worse for safety-seeking investors. You see, pipeline companies are legally structured to pay out most of their income in the form of dividends. These dividends have been an attractive feature for investors seeking safe, reliable expected income. They’re much the part of many ETFs and mutual funds. Today the writing is on the wall that these once-safe dividend plays are set for a major pullback – and a severe round of dividend cuts. As the editor of Lifetime Income Report, last month I sent a warning to my readers (along with a “sell” alert for a handful of these pipeline players.) Today, I want to give you the same warning. With poor earnings and a rather bleak outlook on the price of oil and gas, these pipeline companies will not have the funds to pay out their high yield dividends. In fact, many companies are currently paying out twice their income in the form of dividends just to satisfy investors. They’re doing whatever they can to raise cash to pay their dividend – in some cases issuing more shares or taking on long-term debt. That’s unsustainable at best. And it doesn’t take a rocket scientist to see why investors are fleeing. Energy prices are stubbornly low. Drill rigs are accumulating dust. And there’s a growing possibility that U.S. energy pipelines won’t meet expectations. 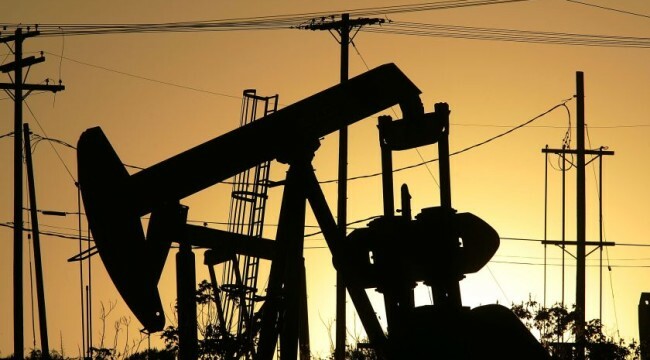 Plus, with Iran ramping up production, Saudi Arabia keeping its spigots open and now Iraq pumping at record levels, oil prices are not likely to rebound any time soon. For now, I recommend scanning your portfolio for these once-safe pipeline companies. Put them on the sideline until we see a rally in oil. Your best bet is to wait out the potential bankruptcies and get back in when the going is good.